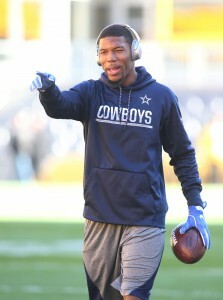 The NFL has suspended Cowboys receiver Terrance Williams for three games, according to Field Yates of ESPN.com (Twitter link). Williams is currently on injured reserve, but he can serve the ban while on IR. While Williams won’t have to miss any time as a result of his suspension given that he’s already out for the season, he will miss out on cash. He’ll be forced to sacrifice 3/17 of his base salary, which amounts to about $618K. All Cowboys players have contract language that voids their guarantees in the event of a suspension, but Williams doesn’t have any more guaranteed money on his deal after 2018. In other Cowboys news, Dallas isn’t currently involved in the wide receiver trade market, tweets Josina Anderson of ESPN.com. Several pass-catchers, notably including Raiders wideout Amari Cooper, are reportedly on the trade block, but the Cowboys are comfortable with their current depth chart of Cole Beasley, Michael Gallup, Allen Hurns, Deonte Thompson, and Tavon Austin. So I take it these suspensions are really mostly large fines.